I'm still here, but it has been a while! Most of you know where to find me these days...Facebook! 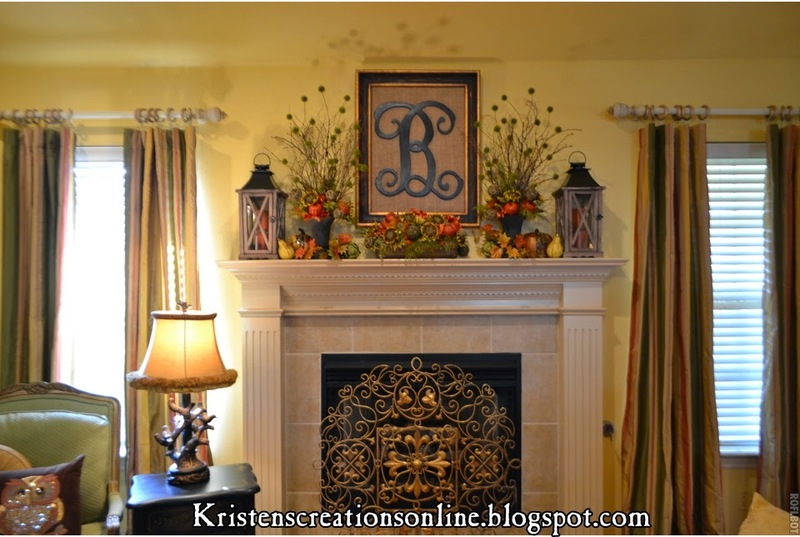 I will still post my seasonal décor here, but I'm so busy with my online business and Facebook that I don't have time to do as many blog posts as I used to do. 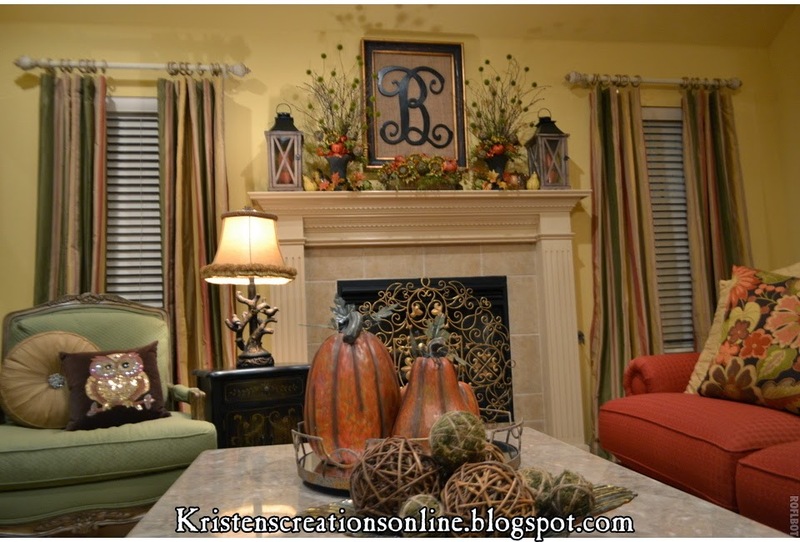 I will be posting the rest of my fall and Christmas décor here soon so be sure and check back! 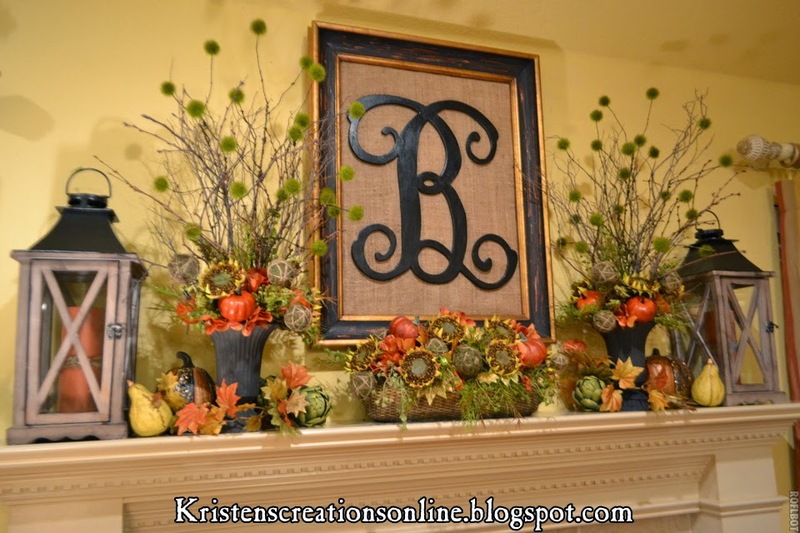 I just finished my fall mantel over the weekend. I hot glued a black wooden B to a burlap covered piece of cardboard and framed it. It was an easy project. I made the arrangements on each side along with the piece in the middle. 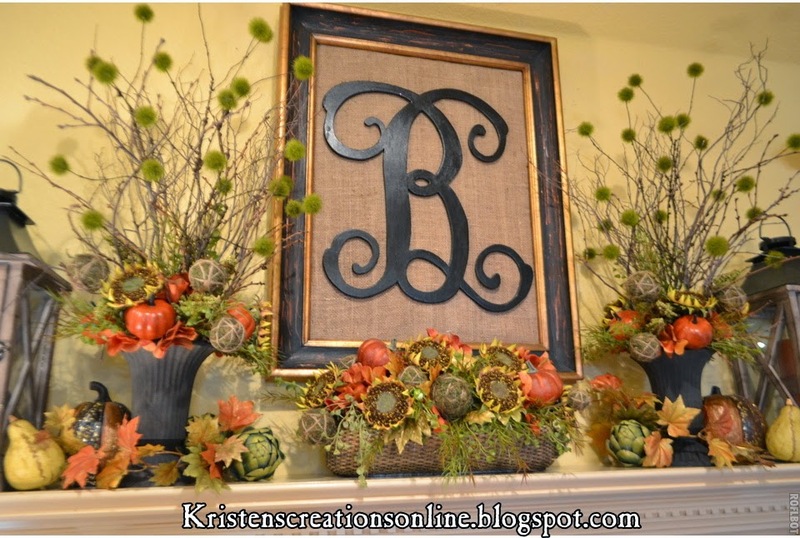 I used sunflowers, pumpkins, natural sticks and moss balls. I especially love the little moss balls coming out of the arrangements. Some of you might notice the new curtains. I know a lot of you loved the red and gold silk checked ones and I did too, but they had to go! I had them for 10 years and they were faded and had holes in them. I found these on ATGstores.com and love them! They are called Mirage stripe if you are interested. They are very well made. Also, the wooden lanterns are from Kirkland's. I added some fall décor to my coffee table along with fall pillows from Kohl's and an owl pillow from Pier 1 Imports I purchased last year. 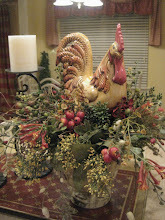 I created this tablescape using a lantern dressed with one of my swags. I added eggs inside along with bunnies beside it. 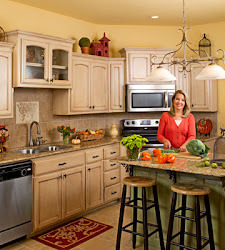 The napkins, hand painted stemware, placemats and lantern all came from Pier 1 Imports. I found the metal tiered basket at Kirkland's a few years back and laid flowers and berries inside along with the nest, bird, and birdhouse. This vignette really brightens up the island! Linking to WOW at Savvy Southern Style. I'm ready for spring! I dressed up my mantel with a gold flower mirror, vases off natural branches, butterflies, nests, and birds. I have also added some spring to the coffee table. Now if I can just finish the rest of the house! This warmer weather is putting me in the mood to decorate! I hope it's warming up where you live! Wishing you a wonderful spring!! Thanks for stopping by! I'm joining Savvy Southern Style for WOW. Spring will be arriving soon...I hope! 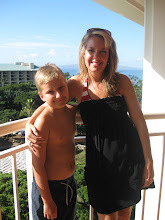 We have had a cold and icy winter here in Arkansas and I am ready for some warm weather! I have been creating Easter items and I'm enjoying working with the lighter colors and bunnies. If you follow me on Facebook then you have probably seen some of these. I will be creating more new items over the next several weeks! I will post listing dates and times on my Facebook page. I hope spring arrives soon for you!! Are you ready for Valentine's Day? My table is set and ready for a romantic dinner.....that I will go and pick up! Ha! My hubby would rather me do that anyway since I'm not a great cook. I think he will like the Italian place up the street. That sounds pretty good to me. I hope he brings home some cupcakes for dessert! That is our tradition every year. I decorated my table with an arrangement I made using silk roses and glittered hearts. The base is actually a mercury glass candle holder. I found the placemats at Kohl's and tied heart ribbon around the red napkins and added a rhinestone embellishment. I hope you are having a wonderful start to the new year! I can't believe Christmas has come and gone and now I'm working on Valentine items! In a few weeks I will be starting Easter and spring. 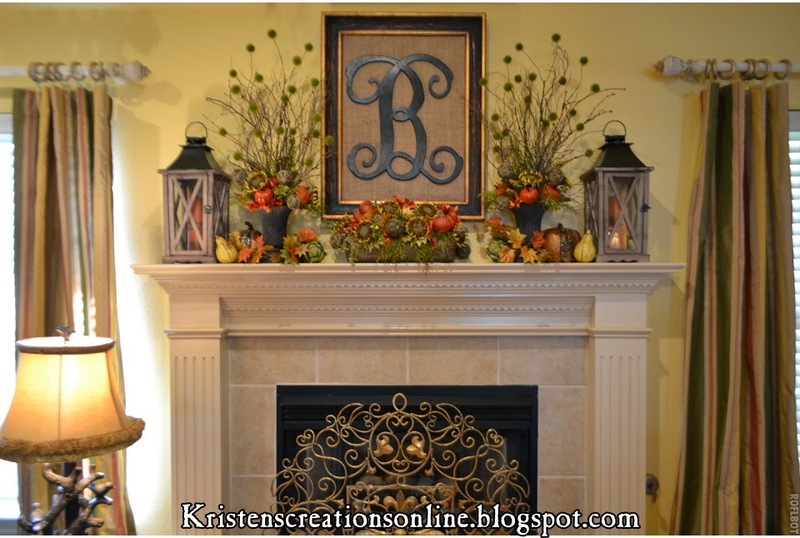 The seasons come quick when you make and sell seasonal décor. I wanted to share some of the Valentine items I have been making. Those of you who follow me on Facebook might have seen some of these items. For those of you who don't follow me I would love to see you there! These lantern swags tie around the top of your own lantern and can be easily changed out for the seasons.